To investigate your bridging loan options in the London and Greater London area, call our team on 0117 313 6058 or fill in our call back form. The loan will be secured against residential or commercial property, which bridges the gap to an exit through the sale or refinancing of the asset. Bridging loans may be offered in amounts ranging from £25,000 to several million, depending on your circumstances and the lender you approach. For homeowners and other property owners - Quickly securing a property. A common reason is so people can buy a new property before selling an existing one to prevent missing out on a particular property they want to purchase. This is a particular issue in London with intense competition for attractive properties. Having finance available can make all the difference. Repairing a broken property chain - The loan can prevent a homeowner from missing out on purchasing their new home if a buyer in a property chain drops out. Again, in London and the South East Of England chains breaking is a common occurence - bridging finance can provide a solution so you don't lose out. Building a house - People wishing to realise a dream and build their own home. Downsizing - These property owners do not require a standard mortgage, but can use bridging finance to buy before the sale of their existing property so they can move quickly and independently. Converting a barn (or other property) - Looking to move out of London? For people wanting to live in in the countryside to build their grand design home or for developers looking to turn a profit. Auction finance - For people buying property at auction, bridging finance can allow them to pay the required percentage needed as a deposit and then complete the transaction in the time provided for by the auction contract. Temporary cash flow cover - Borrowers looking for a short-term loan during a property transaction can use a quick bridging loan to get a cash injection. For property developers and investors - Unmortgageable properties. Bridging loans can also be used to develop run down properties, where traditional mortgages would not be approved. For example, a traditional lender will not approve mortgages on properties that have no bathrooms, toilets or kitchens or are not watertight. Renovation and development - The funding option can be used by those wanting to renovate a property, or those wanting to develop a piece of land into one house or even multiple houses. Fast access to finance - Bridging loans can be used to take advantage of market conditions and discounted investment opportunities, helping to finalise negotiations so that opportunities are not missed. For businesses raising capital - Bridging loans can be secured against land and property so that companies can raise finance in a short timeframe, for example, buying stock as an alternative to asset purchase finance. Tax liabilities - Businesses can use bridging loans if a tax demand is made, and the amount cannot otherwise be accessed within the required timeframe. Meet business obligations Borrowers - looking for short-term funding to meet business obligations and payments or overcome financial difficulties? Bridging loans are a possible short-term option. Bridging loans are used at times when there is a temporary cash flow issue or a tight deadline, where a quick short-term loan is required to rectify the situation or provide a viable financial solution. A bridging loan can be used for almost any purpose and can be secured on many different types of property. In some cases you may be able to borrow up to 80% of the value of the property. To discuss how you might be able to access bridging finance in London, call or broker team on 0117 313 6058 or complete our request callback form. 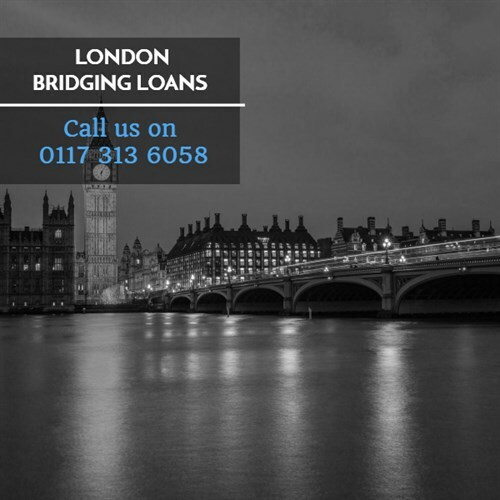 Call us for a FREE initial conversation on 0117 313 6058 about your bridging loan options in London or request a callback.